Previous articles in AirMail have focused on “Airports in Action”. I am now redirecting focus from the airports to the people who are making things happen at each airport. In earlier issues I have presented several EAA and VAA Chapters around the country whose membership places a priority on developing young people. I have been very pleased to find, first of all, that there are many chapters that have this priority, and secondly, that as a result, a large number of these chapters have very active youth programs. This issue will again present “Youth in Action” – a story about a young person who is in the process of developing an aviation career or one who has a very intense interest in vintage aircraft. The purpose is to inspire other young adults to follow their example and to motivate those chapters without a youth program to start working toward that goal. We are all aware of the importance of working with young people to further a career in aviation along with creating an interest in vintage aviation. The young man we are presenting this month took his first airplane ride in a Piper Clipper at the age of 5. What a great airplane to spark an interest in flying. Trevor Niemyjski states that he has been interested in aviation as long as he can remember. His father started flying when Trevor was 6 years old and his grandfather has been flying for a number of years. Aviation has become a family interest. Trevor’s parents actually own a grass landing strip in North Cape, Wisconsin. Not only is Trevor an accomplished pilot but he has also been involved in the restoration and maintenance of aircraft. He works with an IA performing annual inspections and doing maintenance on their airplanes. He has been involved in the restoration of an Aeronca Chief and has built a Clip Wing Taylorcraft. He says that he enjoys working on aircraft as much as flying them. This young man worked hard to get his initial flying time. Financing a Private license can be a major challenge for anyone, much less a 15-year-old person. I asked Trevor how he financed his flying and he said that he was very fortunate in that his parents owned the Piper Pacer he used and helped with his fuel prior to solo. After solo he paid for an instructor and for the fuel used through a summer job. What advice does Trevor have for a young person who thinks they may want to learn to fly? Find an airport where you can “hang out” and find a good mentor. Go to every fly-in you can attend and be sure to find a way to spend time at AirVenture each year. He also recommends the EAA Young Eagle Program as a way to begin flying. Trevor is very active himself in vintage flying. 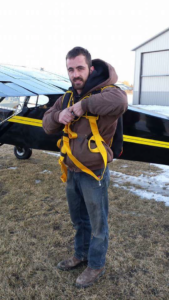 He has participated and continues to participate in AirVenture, the Antique Airplane Association fly-in at Blakesburg, Iowa, and the Midwest Antique Airplane Club in Brodhead, Wisconsin. He is one of the Directors of the MAAC along with being President of the Wisconsin Chapter of Antique Airplane Association. He is a member of EAA and of Vintage Aircraft Association. This young man of 23 is well on his way to becoming more and more involved in vintage aviation. He is currently working as a heavy equipment operator and plans to stay with that career. 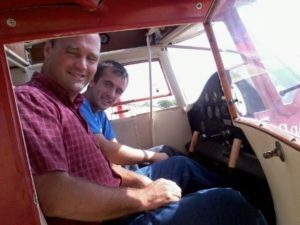 He wants to continue to enjoy working on and flying antique airplanes. I ask Trevor if has any interesting flying stories and he recalled flying a Monocoupe 90A back to Wisconsin from Texas with his dad after purchasing the airplane. He said it was a great flight with no radio to talk with or to navigate with – just 12 hours of flying looking at a map and finding their way. How does he think we in EAA and VAA can get more young people involved in aviation? He says to continue promoting the Young Eagle Program and inform young people that flying is actually reachable. He says “pick up a cheap Taylorcraft, Chief, or similar airplane and start flying”. We in VAA know that he is absolutely right. Vintage aircraft provide an affordable way to enter into aviation and to learn to fly.